Summary: David Smith is giving his life for his art—literally. 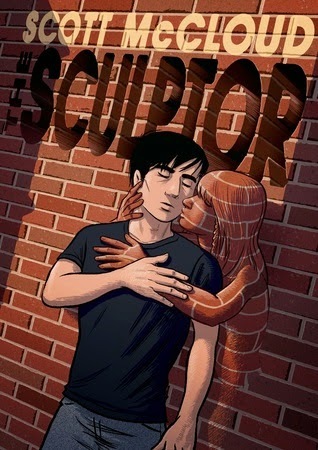 Thanks to a deal with Death, the young sculptor gets his childhood wish: to sculpt anything he can imagine with his bare hands. But now that he only has 200 days to live, deciding what to create is harder than he thought, and discovering the love of his life at the 11th hour isn't making it any easier! I loved this book, honestly. First of all, I love the artwork. The shades of blue, the facial expressions, the artistry... It's fantastic and really worked for me. Maybe that's something that's just taken for granted in the graphic novel world, I really don't know - like I said, first one! But the style here just really worked for me, all in blue-black tones that convey so much - the surreal qualities of the world we're reading about, the depths of David's emotions. I've included a picture of the front and back covers, here, just to give you an idea... The cover really doesn't do it justice, imo. I know some people don't like the monotone artwork but I loved it. Some very good criticisms have been leveled at this book, and many of them are accurate. Is this book a bit predictable in ways? Yup. Does it fall prey to the usual tropes of the tortured artist and the manic pixie dream-girl? Yup. Here's the thing, though - a very important thing that I think some people forget - acknowledging the flaws in a work of art doesn't necessarily mean that it's unlikeable. Now, do tropes and flaws ever mean that we find it impossible to read a book or enjoy the story? Of course. That happens all the time. However, that's not always the case, and that was the situation with me, here. Then we have Meg. Meg is another artist, she sleeps through her friends like that's totally normal (hey, in some circles it is), she pushes people away but doesn't want them to ~leave her~, she's got mental health issues and in spite of all of this everyone loves her. In spite of it all, though, I loved this book. It moved me. I rooted for David, I cared about his friendships, I wanted things to go right for him, both in art and elsewhere. I knew what was coming but held my breath against the inevitability of it all, because it didn't seem fair. The book touches on family and life and love and art and what it means to be alive, the decisions and the choices we make and how they shape us as people. It's a journey of growth and birth and death. And when I closed the last page the first thing I thought was that I wanted to read it again. This book definitely has its flaws, and some people may rightfully find it difficult to get past them and enjoy the story. For me it worked, though, and for some other people out there it may work as well. I'd recommend giving it a chance, at least!